Farming is a game mechanic that allows you to grow your own food. Most of the different crops have many common attributes. I'll talk about those common attributes first and then talk about some of the special cases. It's recommended that you read the starter guide first. Crops can be found growing all over the world. They are placed there during world generation. Breaking these crops are essential for finding seeds. You need seeds to plant crops on farmland in order for them to grow. Farmland can be made by using a hoe on soil. This will create dry farmland. Plants will not grow on dry farmland. 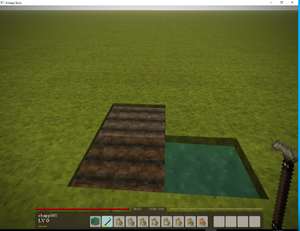 You need to be within 3 blocks of a water source block in order for the farmland to convert to moist farmland. Moist farmland has 3 nutrient levels, N,P and K. Each crop consumes one of these nutrient levels. Some crops require more nutrients than others. Each crop has different total growth speed. Each crop can have any amounts of growth stages. Some crops can be harvested with right click, without destroying the crop. When crops grow from one stage to the next they will consume nutrients from the farmland on which they are planted. The required nutrient is the nutrient that will be consumed and the amount is determined by dividing the Nutrient Consumption by the number of growth stages. Farmland slowly replenishes nutrients, slower with a crop, faster when empty. Three different fertility types of soil exist in the world: low, medium, high. Each has according starting levels of nutrients: 25%, 50%, 75%. Crop growth rates also differ. Soil keeps it's property when dug out and placed elsewhere. You can find flat patches of rich soil in mild and hot areas with enough rain drop, mostly on plains and low hills. Growth Stages - The number of growth stages for a crop. Total Growth Days - The number of in game days it takes for a crop to be fully grown. Required Nutrient - The type of nutrient(N,P,K) that will be consumed from the farmland when a crop grows to the next stage. Nutrient Consumption - The total amount of the required nutrient that will be consumed over the lifetime of a crop. Here are all the available crops. Click on their respective pages to learn more about each one.